Teen Vogue’s Trump takedown is not a surprise, because the magazine rocks. Teen Vogue’s Fiery Trump Takedown Shouldn’t Be a Surprise. Teen Vogue Rocks. 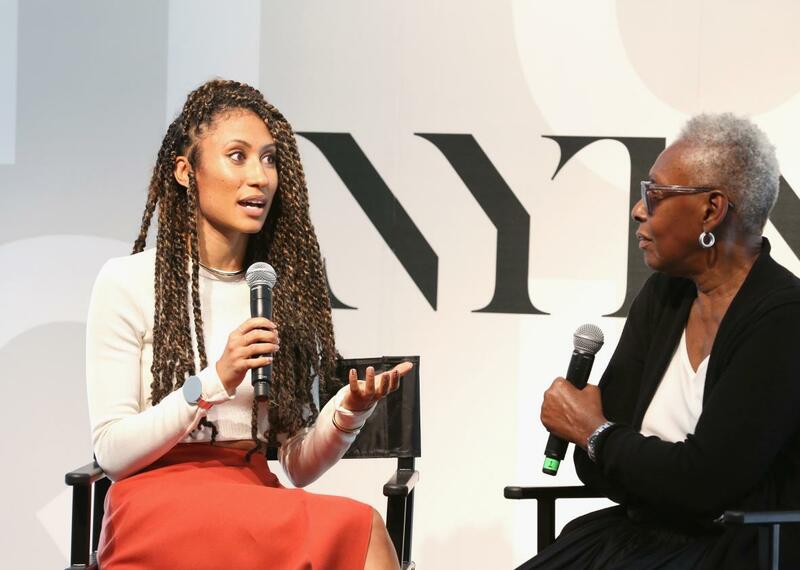 Teen Vogue editor Elaine Welteroth (left) speaks with pioneering black runway model Bethann Hardison. It’s a great piece, written by an award-winning journalist, full of the vim and spirit and acuity we should demand of the press today. But it threw plenty of readers for a loop because of the outlet in which it ran. Teen Vogue, Twitter wondered aloud: Isn’t that a magazine about dresses and boys? Well, yes and no. Teen Vogue does run plenty of light articles about the less consequential concerns of teenagers. But the magazine also treats teenagers like rounded human beings with agency and intellects. The result is a teen glossy with seriously good political coverage and legal analysis, an outlet for teenagers who—shockingly!—are able to think about fashion and current events simultaneously. After that, I kept an eye on the magazine and realized it was moving in a smart, progressive direction. Teen Vogue’s write-up of North Carolina’s hateful HB2 included the voice of actual transgender people targeted by the law, something plenty of outlets inexplicably elided. Its coverage of Gavin Grimm’s legal battle against his transphobic school district depicts Grimm as a human being stigmatized by a cruel rule, not a strange curiosity or a faceless abstraction. Its articles on LGBTQ rights are consistently terrific, and it highlights issues and rulings that the mainstream media often sidelines or ignores. (Lily Herman’s Teen Vogue piece on Republican hypocrisy following the Pulse nightclub shooting in Orlando is, frankly, better than my own.) And the magazine’s reproductive rights coverage is humane, empathetic, and resolutely science-based. Why is Teen Vogue so great? Two theories. First, the magazine clearly goes out of its way to hire women, writers of color, and sexual minorities—groups that, sadly, remain underrepresented at most outlets. This inclusion of diverse voices pushes the magazine in bold editorial directions. Writers are clearly encouraged to pursue their passions, which include pressing, topical issues like the Black Lives Matter movement. Of course, writers everywhere like to pursue their passions. But when you hire a diverse crew of smart people—rather than, say, a stable of mostly straight white men—you’ll wind up with a fiery denunciation of Mike Pence rather than a tedious entreaty begging minorities to be nicer to racists. Plenty of outlets devoted to straightforward reporting could stand to take a page from Teen Vogue’s uncompromising editorial ethos. But they won’t: The allure of false equivalency is simply too strong to resist for editors whose money and privilege will protect them against Trump’s worst excesses. Welteroth and Picardi’s masterstroke was putting together a team of writers who can’t afford to close their eyes to reality, to pretend that Trump deserves our respect and support, that the rise in racism, misogyny, and anti-LGBTQ violence is really nothing to worry about. Teen Vogue’s writers have too much on the line to euphemize or disregard the grievous threat that Trump poses to the country. You want fearless journalism in the age of Trump? Put down that ridiculous Nicholas Kristof column. Start reading Teen Vogue. *Update, Dec. 12, 2016: This post has been updated to include Phillip Picardi’s role at Teen Vogue.